Un connubio tra volumi essenziali, trame e materiali, in cui la cura artigianale per i dettagli caratterizza un design lineare e rigoroso: la cucina Obliqua di Ernestomeda propone un’immagine equilibrata, ma dalla grande personalità. La scelta del suo nome deriva proprio dalla sagomatura a taglio di ante e top, in una linearità che si traduce nella continuità cromatica dell’unica finitura per top, gole, ante e zoccoli. Tra le possibilità della cucina Obliqua, anche il layout con tavolo integrato, disponibile in varie finiture, tra cui spiccano le note calde e avvolgenti dei legni massello Deluxe. Grande attenzione ai materiali: i legni derivano infatti da traversine ferroviarie inutilizzate e ritrovate in vecchie rimesse, a cui Ernestomeda ha dato nuova vita lasciandone invariate le caratteristiche estetiche originali, dalle venature alle variazioni di colore, risultato della naturale azione del tempo e degli agenti atmosferici. Non mancano anche materiali dall’alto contenuto tecnologico e innovativi, come il FenixNTMTM e la biomalta, una resina a base acrilica performante, caratterizzata dall’estrema resistenza all’usura e all’adattabilità a qualsiasi superficie. Grazie alla sua lavorazione artigianale, la finitura si arricchisce di dettagli sempre diversi, che rendono unica ogni composizione. Non solo eleganza estetica, ma anche funzionalità sia nell’ampio piano di lavoro, sia nell’apertura delle ante. Abbinabili con la cucina Obliqua sono le armadiature Indoor, personalizzabili nei complementi, come piani estraibili e schienali in diverse finiture, e negli accessori, dalla macchina del caffè alla cantinetta per i vini, fino ai pratici cestelli. 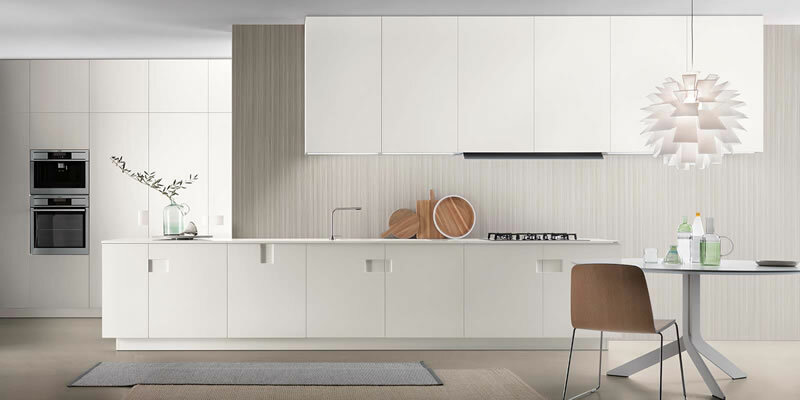 The guidelines for the project are functionality, design, clean aesthetics and technical performance: Icon is a kitchen marked by the expressive simplicity and emotional force that satisfy everyone who loves rationality and functionality without having to give up the heart of things. Icon is characterised throughout by impressive high-tech solutions, starting from the various opening/closing systems and the sophisticated use of materials. The project was awarded the Red Dot Design Award 2013 and selected by ADI Design Index. Elegant lines, slender thicknesses, authentic textures and personalisation: these are the main features of Emetrica. 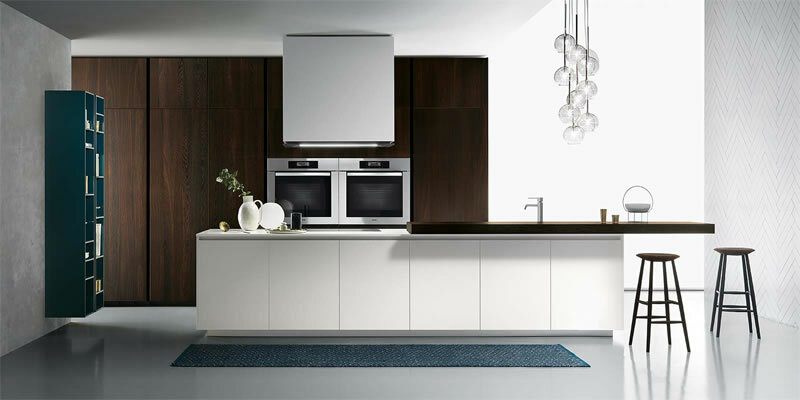 The kitchen's minimal elegance and harmony of style are expressed by the discreet line of the horizontal grip grooves and the full-height handles on the cupboards, which blend into the rest of the furnishings while still delivering convenience and design. 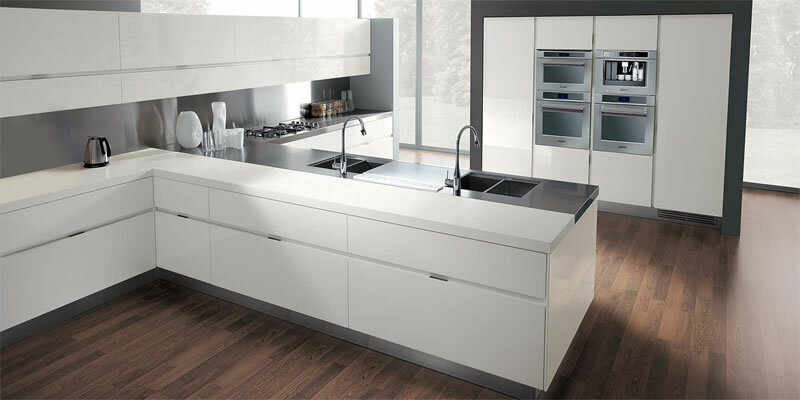 The slender thicknesses are found on the doors, handles, hoods and work-tops. The authentic textures are provided by a perfect wood effect, conveying warmth and exquisite finishing. 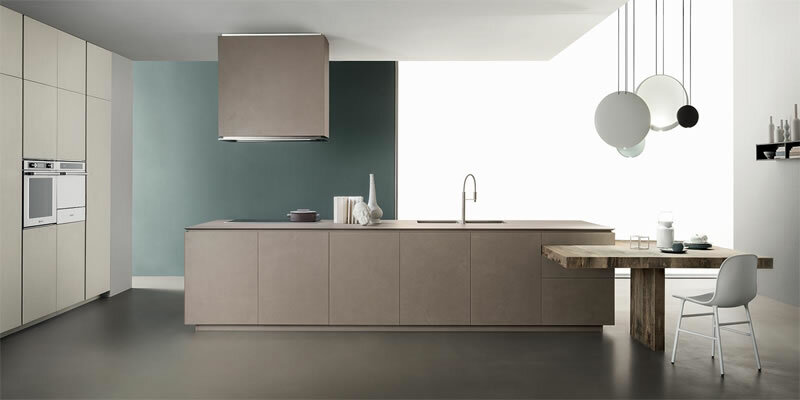 Personalisation is an important parameter in Emetrica: the grip groove, plinths, handles and even the hoods, which become interior design features with new styles and shapes, are available in the same colour codes as the lacquered doors. Emetrica, a kitchen where life and sharing create an open, living space. A simple, discreet formal language, an unusual yet effective layout with the various functions assigned to five horizontal layers, and inspired use of materials that ensure unbeatable performance in daily use. 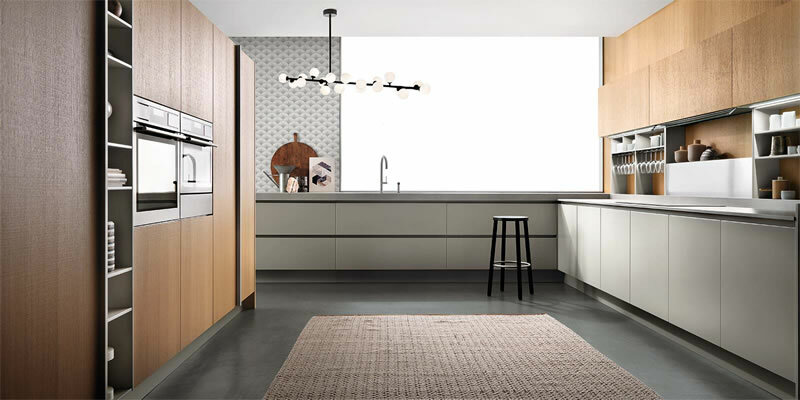 This is Elektra italian kitchen, the Ernestomeda programme with a streamlined image and vast opportunities for personalisation in function and look, achieved by combining materials such as steel, Corian®, marble and walnut, in an attractive blend of volumes and choice finishes. Barrique – designed by Rodolfo Dordoni - is inspired by the all-Italian tradition of good fellowship, fostered by the pleasure of savouring a fine wine or sophisticated dish. The warmth of wood, the timeless beauty of glass, and the subtle shades of bordeaux, brown and grey. All these delicate impressions create Barrique, a functionally impeccable kitchen with elegant design that combines transparent surfaces, natural stones, woods and more high-tech materials, where tradition reveals an extraordinary flair for innovation. Eclectic, versatile, elegant. Carré makes breadth of assortment the key to its strength. A project able to create compositional layouts ranging from the total live-in to the semi country. At the stylistic state of the art, capable of combining a wide variety of colour and material options and creating strikingly diverse room designs. Another distinctive feature of Carré is the handle, transformed into an elegant groove in the door which can be created in no less than 230,000 shapes, sizes and colours. 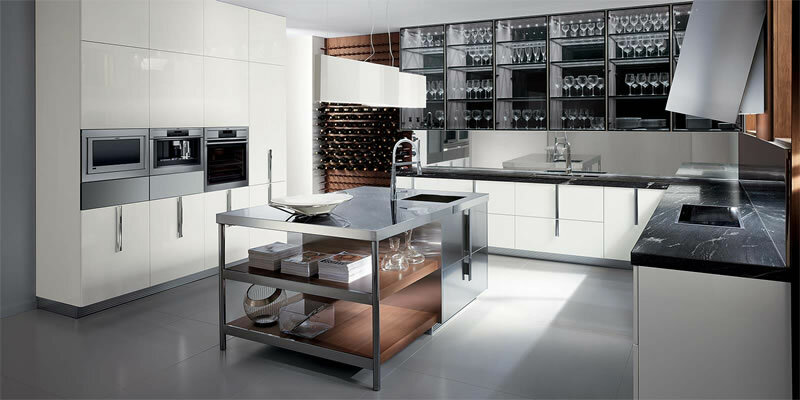 Z.Island is a multi-sensorial kitchen conceived by architect Zaha Hadid in collaboration with Ernestomeda and DuPont. Z.Island brings concrete innovations that will be useful for the processing of the materials, the structural organization and the integration of advanced technologies.